Installation view of Glenn Ligon: Untitled (America)/Debris Field/Synecdoche/Notes for a Poem on the Third World, Regen Projects, Los Angeles. Photo: Fredrik Nilsen. 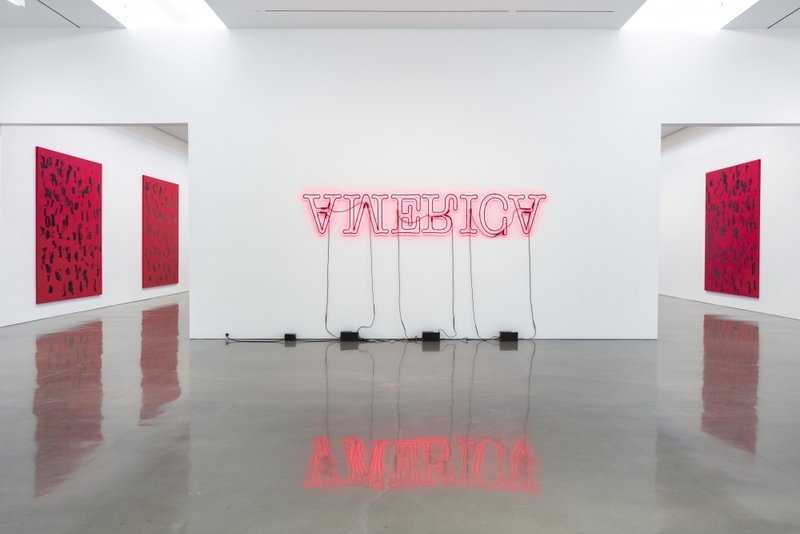 Untitled (America)/Debris Field/Synecdoche/Notes for a Poem on the Third World, an exhibition of new work by Glenn Ligon, is currently on view at Regen Projects, Los Angeles. For this exhibition, Ligon presents a new series of silkscreen paintings based on abstracted letter forms and several neon installations. This marks the artist’s sixth solo presentation at the gallery. Glenn Ligon’s wide-ranging multimedia art practice encompasses painting, neon, photography, sculpture, print, installation, and video. Perhaps best known for his monochromatic and highly textured text paintings that draw their content from American history, popular culture, and literary works by writers such as James Baldwin, Zora Neale Hurston, Ralph Ellison, Gertrude Stein, and Jean Genet, among others, his work explores issues of history, language, and cultural identity. For more information, please visit Regen Projects' website.